Bad hair day? These photos will make you feel 100 times better! Remember the haircut you had when you were still young? Yep, those days when a drunk Edward Scissorhands fooled around your mane. Embarrassing, ain't it? But don't worry; we'll make it up to you for making you remember those awful days. These photos below—the 9 most cringeworthy hair crimes in man history—should do the trick. And if you're having a bad hair day today, these should make you feel a whole lot better. It's as if the barber put a bowl on top of your head and cut everything underneath. 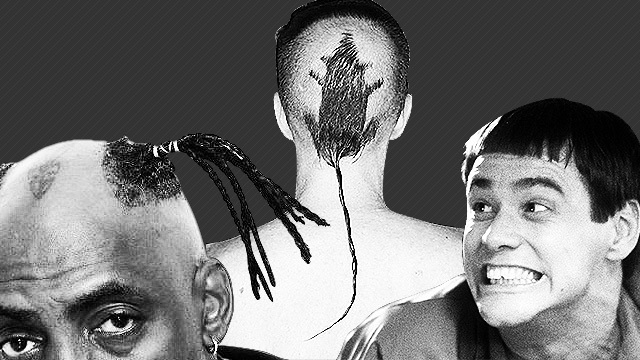 The "rat tail" looks like a mohawk fitted with longer strands of hair growing downward from the back of the head. What's worse than having a rat with a long tail on the back of your head? A hairdo featuring a guy pooping! AKA a time in our life we'd like to forget. Dreadlocks + Pigtails = WHAT THE HELL WERE YOU THINKING, COOLIO? It's a bowl cut with a bit of an emo feel, a dash of side mullets, and a shaved back portion. Not all things mix well.